It is now illegal for any person fishing this river to have American Shad in their possession. All American Shad inadvertently caught by anglers must be immediately released back into the water. The Nottoway is a DCR designated state scenic river, with a minimum of development and good fishing for a variety of species. It begins in Nottoway County, meanders through the Commonwealth’s piedmont and coastal plain then, at its confluence with the Blackwater River, forms the Chowan River in North Carolina. It has a diverse fishery, ranging from bass (both largemouth and smallmouth) and catfish to shad and herring. Panfishes, including bluegill, redbreast and redear sunfish, Roanoke bass, yellow perch, and black crappie are also common. The Nottoway produces some trophy fish, primarily redear sunfish and blue catfish. Bowfin and gar are common in the lower section. Fishing for shad and herring can be excellent in March, April, and May, as they run up from the Chowan. The Roanoke bass (more commonly known to locals as “rock bass” or “redeye”) is a species of special concern in Virginia. Only a few rivers have them, but the Nottoway has quite a few with fish over one pound common. They are generally found upriver in the summer and down river in the winter. A few smallmouth bass are found throughout the river, with more fish found upstream. The Southampton County portion has most of the big redear sunfish. Public boat ramps are located at Double Bridge, Jarratt, Carey’s Bridge, Peter’s Bridge, Hercules Landing, and Route 258 near Riverdale. Water levels fluctuate naturally according to seasons, so anglers should scout the river and plan ahead. Canoes can be launched at several bridge crossings. Bank fishing access is limited to a few bridge crossings, state boat ramps, and canoe access areas. No permits are necessary. You can wade much of the river upstream of Courtland in summer when the river is low. This is a trip for canoes only, as the river reaches the Fall Line in the last three miles of the trip. Put in at the Rt. 609 bridge and take out at the VDGIF boat ramp on Rt. 651, just past the Rt. 619 bridge. A few class I and II sections must be negotiated, but should not present much of a problem. The river here is scenic and undeveloped. As a matter of fact, you may not see another person during the float. Fishing in this stretch can be excellent with redbreast sunfish, smallmouth bass, and Roanoke bass providing most of the catch. This is a long trip with plenty of good-looking fishing waters. Anglers need to pace themselves so they reach the lower rapids before nightfall! Put in at the VDGIF boat ramp on Rt. 651, and take out at the VDGIF boat ramp at the Rt. 630 bridge. This is an easy stretch, mostly flat with just a few class I raffles. Anglers will enjoy having the time to fish for Roanoke bass, smallmouth bass, and redear sunfish that inhabit this section of the river. Redbreast sunfish are abundant here and can provide plenty of action. Walleye are caught here occasionally, typically in the late spring. The trip from Rt. 631 to Rt. 653 is recommended in the lower stretch. If I had to pick my favorite section of river, this would be it. There are VDGIF boat ramps and off road parking areas at these two bridge crossings. The float is a little long for canoeists to fish much, but the scenery is nice and the float is very easy. The river is deeper here than upstream, so anglers can use small motors to cut the float time, allowing them more time to fish the good spots. This transition area from the fast flowing waters upstream and the slow, swampy areas downstream provides anglers the chance to catch a little bit of everything. VDGIF ramp sites in bold, other routes have canoe access with limited parking. I’ve fished quite a few rivers across Virginia and if I had to choose a favorite, I’d have to pick the Nottoway. Actually, if I had to pick a favorite fishing spot, lake, or river, I’d pick the Nottoway. Sure, there are places where you can catch more fish, places where you can catch bigger fish, and places that may be a bit more scenic, but if you like catching fish, with some variety in sizes and species, plus have a little scenery tossed in as well, the Nottoway is worth checking out. The Nottoway River is located in south central and southeastern Virginia. The river’s length is approximately 130 miles. It begins in Prince Edward and Lunenburg counties and flows southeasterly, forming a boundary for Nottoway-Lunenburg, Brunswick-Dinwiddie, and Greensville-Sussex counties, then meanders across Sussex and Southampton counties to its confluence with the Blackwater River at the North Carolina line, forming the Chowan River. Above the Route 619 bridge on the Greensville-Sussex County line, the river is generally shallow, clear and fast flowing. There are numerous small rapids that prevent the use of outboard motors and large boats, but canoeists will find some nice float trips. Below Route 619, the river slows, deepens, and darkens as numerous swamps in the Coastal Plain join it. This part of the river, particularly in Southampton County, is large enough for bass boats during normal flows. For anglers, the river’s fishery could also be divided at the Route 619 bridge. The upper river has numerous redbreast sunfish, smallmouth bass, and Roanoke bass. Below the bridge, bluegill, largemouth bass, black crappie, and blue catfish are more common. In the spring, anglers can catch blueback herring, American shad, striped bass, and white perch migrating upstream from North Carolina. The fun part of fishing the Nottoway is you never know what you might catch. In one season of sampling fish and angling on the river, I saw 51 different species of fish. It’s not unusual to catch six or eight different species of fish on a given day on one lure. If you want to have some fun, switch lures and baits a couple of time and see how many species you can catch in a day. Every time I fished the river with someone, we ended up having a contest to see who could catch the most species, the most fish, and the biggest fish. The Nottoway is that kind of river. It’s not really a place for trophy fish seekers or those wanting to bring home dinner, though you certainly could. It’s the kind of place where a couple of fishing buddies can have a good time catching and releasing a wide variety of fish. The numbers aren’t bad either. If the water’s clear, you can shoot for catching a hundred fish in a day. For anglers who don’t have a boat or can’t find a canoeing partner, there’s always wading. 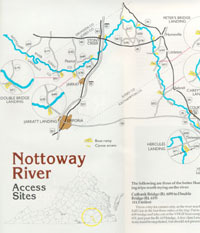 The Nottoway can be a great river to wade and fish in the summer and fall. You might want to avoid wading in the spring, because spring flows are typically a little strong, and the river can get muddy after a good rain. In the summer and fall though, the river is typically low and clear. Head for one of the bridge crossing accesses along Rt. 40, or better yet, head up to the Rt. 619 ramp and jump in! On a hot July day, nothing beats standing waist deep in a cool, clean river, catching Roanoke bass and smallmouth bass on an ultra-light rod. If you go wading at the Rt. 619 ramp, don’t worry if the water seems too cold when you step in. You are actually feeling the little spring creek that flows in next to the ramp, which is a lot colder than the river. Once you venture a few feet out into the river, the water’s perfect. The Nottoway River is a four-season fishery. With its southeast location, the winter isn’t too severe on the lower river, and anglers can catch some nice fish. Winter is a great time to fish the lower Nottoway River around Courtland for one pound and larger Roanoke bass. Find the deeper holes and fish on the bottom with small, live shiners. In recent years, a greater number of striped bass have been caught in the winter around the Rt. 258 bridge. To catch these angler favorites, use larger minnows, shad, and jigs. In February or early March, depending on water temperature, American shad, hickory shad, blueback herring, and alewife migrate upstream into the Nottoway on their annual spawning run. Southampton County is a good fishing spot early in the run, but most of the bigger American shad head upriver into Sussex County to spawn in the faster flowing water there. Peter’s Bridge Landing (Rt. 631) is a good place to launch a boat and drift shad darts and small spoons for shad. White perch and yellow perch also run up the river in the spring and can provide some good angling. Hungry striped bass will follow the shad and herring schools upstream and add some excitement to a quiet day on the river. By late spring, largemouth bass and redear sunfish are active in the backwaters downstream of Courtland and are targeted by many anglers. The lower Nottoway River is an excellent location for one-pound plus size shellcrackers. Lily pad beds along the shore and in backwater sloughs hold some of the bigger fish. The summertime offers good fishing throughout the river, but anglers will typically either head further upstream or further downstream depending on their preferred species. As the river gets warmer, many species will head upriver to find cooler, flowing water, while other seek out deep, quite pools in the lower river. Around the Fall Line, waders and canoeists can cast small spinners and floating crankbaits to entice smallmouth bass, Roanoke bass, and redbreast sunfish. Downriver, anglers will find blue catfish, bluegill and bass fishing. Longnose gar school in the pools and are caught easily on live minnows. Gar will also hit slow moving surface lures in the summer. Fishing in Sussex County is especially rewarding at this time of year because you can catch a little bit of everything. In the fall, fish are well distributed throughout the river. Water levels can be low and fish will have found the deeper pools. The lower river provides better action as the water cools and fish start moving down to their winter pools. Basically, Nottoway fishing works on a cycle. Start the year far downstream; follow the shad upriver in the spring; go further up for the summer; and then come back downstream as water temperatures fall again. There are a half dozen paved ramps and about a dozen canoe access areas along the Nottoway, providing boaters and anglers with a wide variety of float trips. There are more access sites and more water in the lower river. The upper river is sandy and shallow, so it is more suited to wading than boating. The first public boat access on the river is at Nottoway Falls on Route 49, south of Crewe (downstream of the Fort Pickett military reservation, the river is deeper and rockier). Canoes can be launched at Rt. 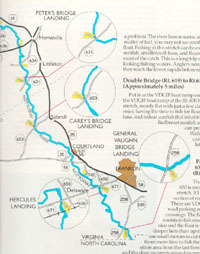 613 and each bridge downriver (except I-85) in Dinwiddie County. In Greensville County and further downstream, there are more public ramps and parking areas for anglers and boaters to enjoy the river. Give the Nottoway a try and I’ll bet it becomes one of your favorites too. Please see Float Trips/Ramps under the Maps section for facilities information. Please contact the VDGIF Chesapeake Office with any questions regarding the Nottoway River.